As I drove up to the stop sign, the leaf fell from the tree. Except it did not fall all the way to the ground. 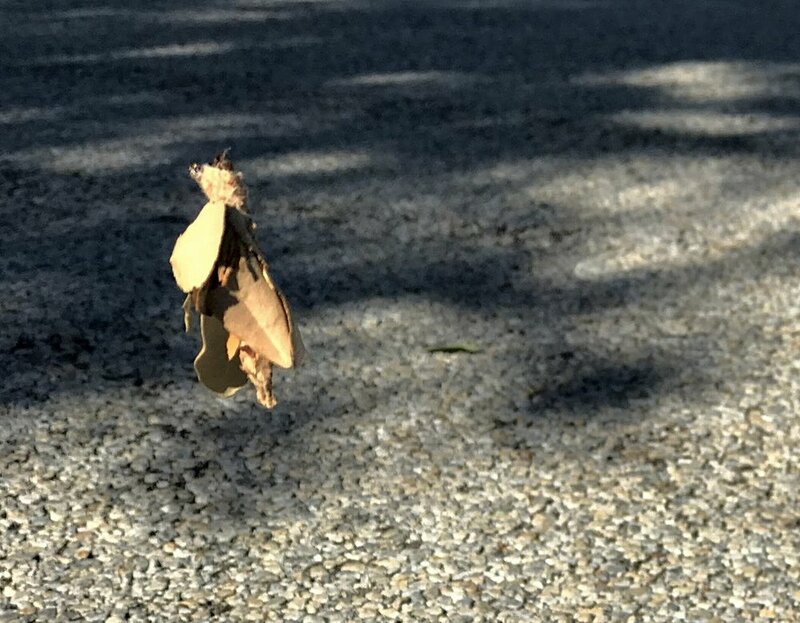 It stopped about 18 inches above the asphalt and then began to spin in the wind. I parked my car and went back to take a closer look. At first I thought it was a leaf caught in a spider web, but then on inspection saw that it was leaves. They were bound together. In the middle was a caterpillar of some sort. His head was sticking out of the top. Well it might not have been its head. I think the slender thread was coming out of that area. The whole top portion writhed in a very creepy way. I watched as it spun and drifted in the wind. The next car that came through, would not likely see it. Its next destination was going to be a bumper. I headed back to my car thinking of this dive bombing bug. It launched itself out of a tree expecting to find-freedom or a better tree? I'm not sure at all why this pathway was going to produce anything for the worm except heartache. He should have just stayed in the tree. It was full of leaves. It is a big tree. There was room for him and many more. It is the way of many of us. We decided to reject the way we know in favor of the unknown. We trade the values we were given as children for the values of our society. We ignore the advice of wisdom for the advice of untested peers. I have seen people trade in relationships of love for the hypothetical greener grass. Don't get blown around by the wind and end up squashed on the street. Hold on to what is true.